When any player uses wine, before it works, Li Ru can force that player to either draw one or discard one card. 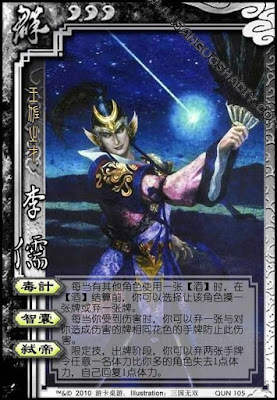 When Li Ru is damaged by a card, he can discard a card of the same suit to prevent that damage. Li Ru can discard two hand cards to hurt any player within range and with more blood one, and heal himself one. Li Ru can force himself to draw a card when he uses Wine. When Li Ru targets a player with "Usurp", they only have to have more blood before the effects happen. Li Ru is able to have more blood after the effects happen.